I have been using Mozilla based web browsers since 2003. Back in the days, the application was called Mozilla Suite, then in 2004 the Firefox showed up using the same engine, but with completely new front end. I migrated my profile over the years many times, but I always kept bookmarks. Some of my bookmarks surely remember those early days before Firefox (yet, majority of the oldest are no longer valid, because sites were shut down). The total number of my browser bookmarks gathered over that time is over 1k. And this is `the problem`. I had several attempts to clean up and organise this huge collection. I have tried to remove dead ones and to group them in folders. I have tried using keywords and descriptions to be able to search more effectively. But with no success. Now I have something about dozen of folders, but I still find myself in trouble when I need to search for particular piece of information. The problem boils down to that: I absolutely remember what the site is about, I am absolutely sure I have it in my collection but I cannot find it because either it has some strange title or words in URL are meaningless (Firefox searches only within titles and urls, because obviously that is all it can do). I realized I need a tool which is much more powerful when it comes to bookmarks searching. I could not find anything to satisfy my requirements so I implemented it myself. 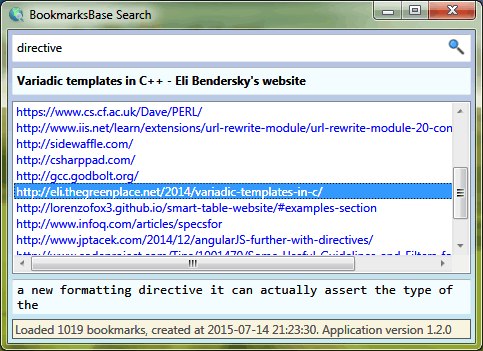 Today I am introducing BookmarksBase which is an open source tool written in C# to solve this issue. BookmarksBase embraces a concept that may seem ridiculous: why don’t we pull all textual contents from all sites in bookmarks. Do you think it is lots of data? How much it would be? Even if you were to sacrifice a few hundreds of megs in order to be able to search really effectively, isn’t it worth that space? Well, it turns out it takes much less space than I originally expected and the tool works surprisingly fast, although it is implemented in managed code without any distinguished optimizations. First we have to run separate tool to collect data (BookmarksBase Importer). Downloading + parsing takes maybe a minute or two. Produced index file containing all text from all sites in bookmarks, which I call bookmarksbase.xml in my case is only 12 MiB (over 1000 bookmarks). Then we can run BookmarksBase Search that allows us to perform actual searching within contents/addresses/titles. Surely, when you have bookmarksbase.xml created you can run whatever serves the purpose for you e.g. 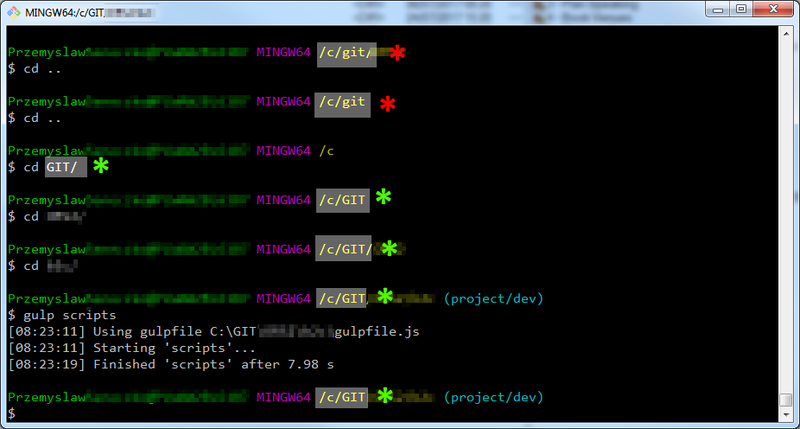 grep, findstr (in Windows) or any kind of decent text editor that can handle big amounts of text. I crafted XML so that it can be easily readable by human: there is new lines, and the text is preserved in nice column of fixed width (thanks to Lynx — see source for details). If you are new to Microsoft Azure you will barely guess that. When you shut down your virtual machine, compute hour counter counts just like when it is running and you have to pay for it as well. This “minor” detail is not explained in many official introductory documentation materials I have read. I have realized that only because I am kind of person who likes to re-verify things over and over again and that is why I went to my account’s billing details. I had used my VM just for few days and each day only few hours and after that I saw nearly 200 compute hours in my bill. Indeed, there are reasonable technical reasons why even powered off machine is billed too. When you create a virtual machine you consume data center resources and they have to remain allocated for you e.g. IP address, CPU cores, storage etc. It does not matter if it is running as this resources still must be reserved and ready for you. The solution for this problem is to use Azure Powershell to control your virtual machines. The default options of stopping command does also what is called deallocation and then the payment counter stops. Below I present quick reference of relevant commands. You need to “log in” to your Azure account from PowerShell. You do this either with Import-AzurePublishSettingsFile filename or with Add-AzureAccount commands. Use the former if you would like to use profile settings file downloaded from the portal, and use the latter if you prefer to just type Microsoft account credentials and have the shell store them for you. 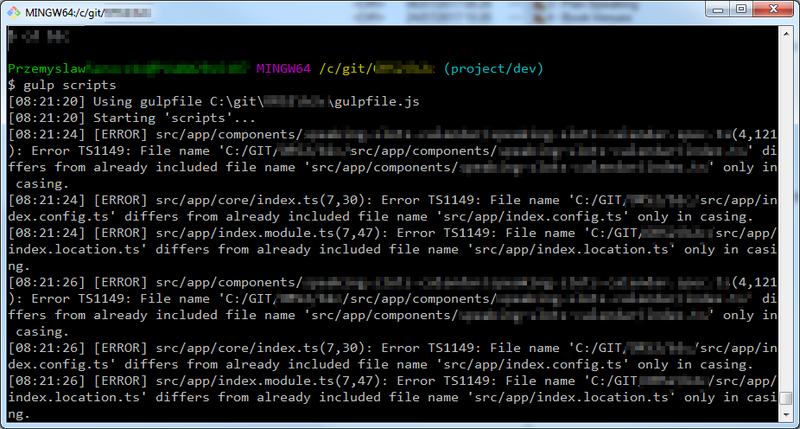 In both cases credentials are stored in C:\Users\**name**\AppData\Roaming\Windows Azure Powershell. Use Get-AzureSubscription to list your subscriptions. Use Select-AzureSubscription -SubscriptionName **name** to switch the shell to apply following commands to this subscription. Use Get-AzureVM to list your virtual machines, their names and their states. Use Stop-AzureVM -ServiceName **name** -Name **name** to shut down and deallocate a virtual machine. Use Start-AzureVM -ServiceName **name** -Name **name** to power on a virtual machine. When you close the shell, and open it again you do not have to log in to your Microsoft Account again, but before you are able to control virtual machines you have to select subscription first.